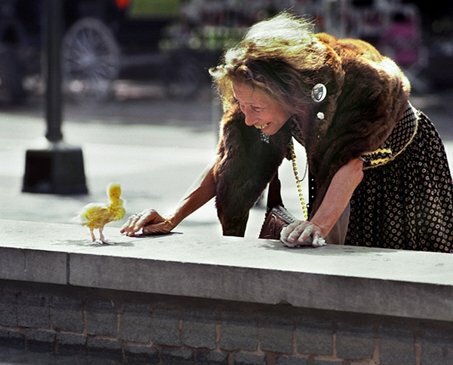 This is Ruthie the Duck Girl as photographed by George Long. I purchased a print of this from the artist and encourage you to see (and buy!) his work. A biography of Ruthie is here. I may have met Ruthie once. I was tending bar in the French Quarter and had a handful of customers one early morning that I normally wouldn’t have but for the incredible rain we were experiencing. Several “street people” were in and it was a scene straight out of A Confederacy of Dunces’ “Night of Joy” bar. Everyone was drinking with no money and spending too much time in the bathroom (not like our local coke heads spend too much time in the bathroom). There was a skinny, tiny little woman present that years later, I’ve convinced myself was Ruthie. She had no ducks with her. Bob French; We’re better than this.